VANCOUVER, British Columbia--(BUSINESS WIRE)--LoRa Alliance 10th ALL MEMBERS MEETING – Cypress Semiconductor Corp. (NASDAQ: CY), a leader in embedded solutions and a LoRa Alliance™ member, today announced it has collaborated with Semtech Corporation (Nasdaq: SMTC) on a compact, two-chip LoRaWAN™-based module deployed by Onethinx. The highly-integrated Onethinx module is ideal for smart city applications that integrate multiple sensors and are in harsh radio environments. Using Cypress’ PSoC® 6 microcontroller’s (MCU) hardware-based Secure Element functionality and Semtech’s LoRa® devices and wireless radio frequency technology (LoRa Technology), the solution enables a multi-layer security architecture that isolates trust anchors for highly protected device-to-cloud connectivity. In addition, the PSoC 6 MCU’s integrated Bluetooth® Low Energy (BLE) connectivity provides a simple, low-power, out-of-band control channel. The PSoC 6 device is the industry’s lowest power, most flexible Arm® Cortex®-M dual-core MCU with a power slope as low as 22-μA/MHz active power for the Cortex-M4 core. The device is a natural fit with Semtech’s latest LoRa radio chip family, which offers 50% power savings in receive mode and 20% longer range over previous-generation devices. The new solution will be showcased at the LoRa Alliance 10th Annual All Members Meeting from June 6-7 in Vancouver, Canada. PSoC 6 is the industry’s lowest power, most flexible MCU with built-in Bluetooth Low Energy wireless connectivity and integrated hardware-based security in a single device. Software-defined peripherals can be used to create custom analog front-ends (AFEs) or digital interfaces for innovative system components such as electronic-ink displays. The architecture offers flexible wireless connectivity options, including fully integrated BLE 5.0. 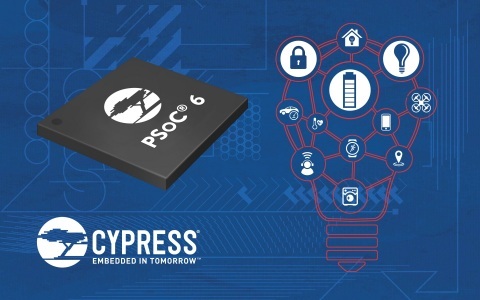 The PSoC 6 MCU architecture features the latest generation of Cypress’ industry-leading CapSense® capacitive-sensing technology, enabling modern touch and gesture-based interfaces that are robust and reliable. The architecture is supported by Cypress’ PSoC Creator™ Integrated Design Environment (IDE) and the expansive Arm ecosystem. Designers can find more information on the PSoC 6 MCU architecture at http://www.cypress.com/PSoC6. Cypress, the Cypress logo, PSoC, CapSense are registered trademarks, and PSoC Creator is a trademark of Cypress Semiconductor Corp. All other trademarks are property of their owners. 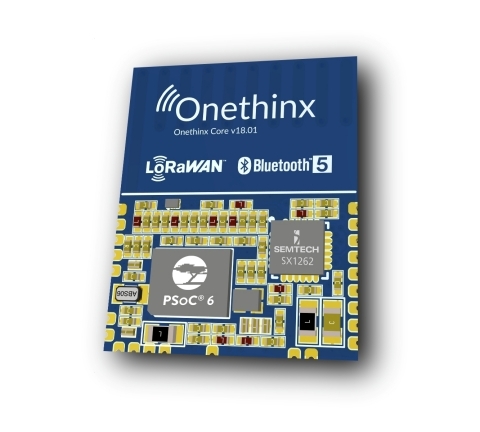 Cypress Semiconductor has collaborated with Semtech on a compact, two-chip LoRaWAN-based module deployed by Onethinx for smart city applications.